Broward County has discovered that allowing a passenger to call a taxicab on the county’s debit card is cheaper than their paratransit shuttles. Forty years ago, I drove a taxicab in Austin, Texas. The Austin Metropolitan Transit Authority, Austin Transit, did a study and found that it was vastly cheaper to use taxicabs and their rider satisfaction was greatly improved. Austin Transit decided to try having its own fleet of sedans to handle ambulatory passengers. I did not know if the Broward County transportation authority was planning to try their own sedans, but Austin Transit did not fare well in their endeavor choosing to expand the taxicab services. Broward’s “Rider’s Choice” program started out as a limited service and was estimated to have saved the county $26,000. They were so happy with the average fare, $13.16 over the transit authority’s fare, $28.00, that they approached the County Commissioners to increase the maximum fare to $18.00 from its current $16.00. With the fierce competition from Uber and friends I would speculate that the disabled community in Broward county will get excellent service from taxicabs. No telling how much Broward county might save if they expand the program. 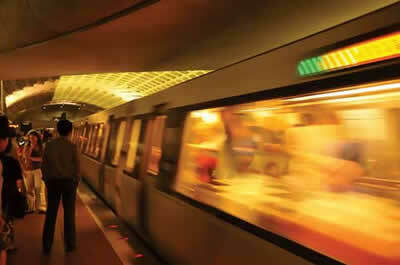 DC Metro is reported to have decided that it will pay up to $3.00 of a taxi, Uber or Lyft fare for late night workers rather than provide them with transit service after 11:30pm. The service is reported to be a way to “soften the blow”of the reduced hours of operation on service industry, healthcare workers and other late night workers. I don’t believe I’ve ever heard of a transit authority paying for their potential riders to ride with someone else. While Metro claimed it needed the down time to continue their preventive maintenance program, I would speculate that it also saves a bundle of money not providing the service during those hours. The report was that the Metro board rejected a “District”proposal. What do you suppose a “District”proposal is? If it’s a proposal from the DC city council it’s no wonder it was rejected. Politicians knee jerk to angry constituents, regardless of how much of other people’s money they have to spend. Uber and Lyft are both reported to be rushing toward initial public offerings. While there will certainly be some multi-millionaires made in the offering, I see the two transportation, uh, technology companies as having the same issues as the taxicab companies, drivers. GPS has effectively dumbed down the taxi business to the point where anyone can get almost anywhere without unfolding a map. Unfolding a map? What does that mean? Yeah. I’ve ridden with Uber and was unimpressed. One couldn’t even find me at a major hotel. While Uber and Lyft have beaten down barriers, I never believed they would they still not have have managed the one thing all business strive to do, make a profit. The rush to driverless vehicles aside, the current world we live in demands a driver. How many times can you count on a customer calling back after the driver can’t make a simple turn because he’s glued to his GPS display? The taxicab industry was complicit in its own demise by allowing all manner of nonsense to go on with their drivers, but Uber promised better. For a time, they delivered but as the demand rose so did the need for drivers. They have warm body syndrome as bad as any taxicab company. With Waymo sporting a six length lead at the top stretch in the driverless stakes, Waymo’s share of Uber may be the only thing keeping Uber from the also ran category. The widely reported antics of some actor I never heard of getting beaten up by Trump supporters yelling “this is MAGA country”was so obviously bogus I didn’t pay a whole lot of attention to it. Chicago is MAGA country? Get serious! What I did find interesting about the case was how the police are reported to have gotten the identities of the two hired “Trump supporters,”from their Uber rides. In fact, reports are that Uber records are used in numerous criminal investigations with the report of 415 requests for data in the latter part of 2015. Really? 2015? This super high tech company doesn’t have newer record than 2015? The article went on to discuss that elusive unicorn: privacy, and how we give it up almost constantly by what our phones attach to when we’re out and about. The other take away from the story, for me at least, is that if you must make up a story to prove a point your point is obviously not valid. Reports are that Alphabet, the parent company of Waymo is looking for “investors.” Well, not really. What Waymo is looking for is a car manufacturer to partner with in order to install Waymo’s driverless technology but not actually own Waymo’s technology. So far they haven’t any takers. Vehicle manufacturers are reluctant to install any “aftermarket” technology which is reminiscent of IBM not latching onto MSDOS. Why wouldn’t every taxicab company on earth want to buy your car? How about parents of teens who want to teach little Johnny to drive? Really, do the people trying to teach little Johnny to drive really know how to drive? Regardless, were I an executive at an auto manufacturer I certainly wouldn’t pass up on a hottie like Waymo.